1)Disable shuffle - Sometimes I enjoy listening to songs on shuffle, and sometimes to full albums from beginning to end. The problem is that when, for example, I listen to "all songs" on shuffle, but then sometime later I want to listen to an albun in the correct order, the shuffle is still on. I personally would find it more comfortable if it would be disabled if I were to start playing a new album, instead of me having to switch it off manually. 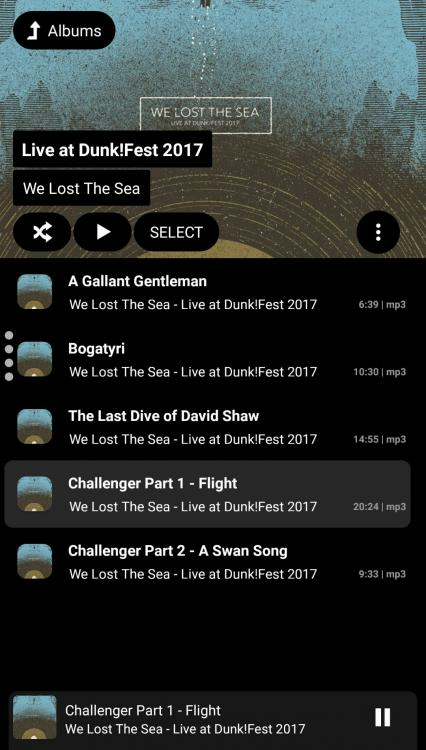 2) Shuffle list - would it be possible to see the entire Playlist as it would be played after you switch on shuffle? And maybe even be able to alter it manually? Right now you only see the next track. 3) playing next/queue - Usually when I listen to an album, I choose it from the albums tab. And near the end (lets say 2 or 3tracks before the last one) , I would like to be able to choose the next album to play once this album is done. The way it is right now is that at best, the next album will be played immediately after the current song ends. 4) Once you choose to play an album, there seems to be a lot of redundant information on the track names (pic attatched). Not only do you see the album name and the artist at the top, but you also see it on each track. It would be simpler and easier on the eyes if the tracks only had the track names, without the artist and the album. At the top you'd still have the artist and album, so it wouldn't be missing. This may seem like a lot, but I really do enjoy the app and I make these suggestions/requests so it can be perfect, for me at least. Usually when I listen to an album, I choose it from the albums tab. And near the end (lets say 2 or 3tracks before the last one) , I would like to be able to choose the next album to play once this album is done. The way it is right now is that at best, the next album will be played immediately after the current song ends. You could build a playlist and extend it while playing. Or you could add to the queue while playing from the queue. In the list view there is a list option for sorting "By shuffle order"
I guess that would work work, but it's a workaround that is counterintuitive to the way I usually use a music app. Usually I just pick an album and go with it, and near the end I choose another one and so on and so on. Your suggestion would mean I'd have endless playlists or start by playing from the queue, not the albums tab. If you begin your first album by adding it to the Queue (long press the album and then picking Queue) you can add another album or albums to the Queue without it affecting the completion of the currently playing album. When you're done with your session you can clear the Queue and start all over again. I personnally prefer using the Queue over any other method of playing music. I think a great "Feature Request" would be to add an option to make the Queue method of playing music the default. Then when you tap an item it would just add it to the queue. Why are those the only two options?! I'd much rather the queue function just like in any other player. Maybe a solution is to have whatever you're now playing (album/song) be put automatically in the queue, and then if you added something to the end of the queue it would make sense. On the other hand, if you don't add something to the queue but instead juat choose to play something else, then whatever that is can replace whatever is in the queue. Yeah, but that's just adding extra steps to achieve the same goal (add queue at the beginning and at the end you have to remember to clear it). Doesn't seem very efficient. I also love using queues, but I guess in a certain way, which is why I posted this in the first place. Ressources are limited, Poweramp isn't any other player, and this forum is no wishing well . No offence meant. By the way, I don't believe both option are really possible, as the first one would mean implementing something totally new, and the likelihood for that to happen ist vanishingly small. But the second option would be easy to implement and has been requested by multiple users, you might support that. I didn't want to seent ungrateful - I do enjoy the app and appreciate the replies here. Glad to see that I'm not alone in this and that it might be solved. 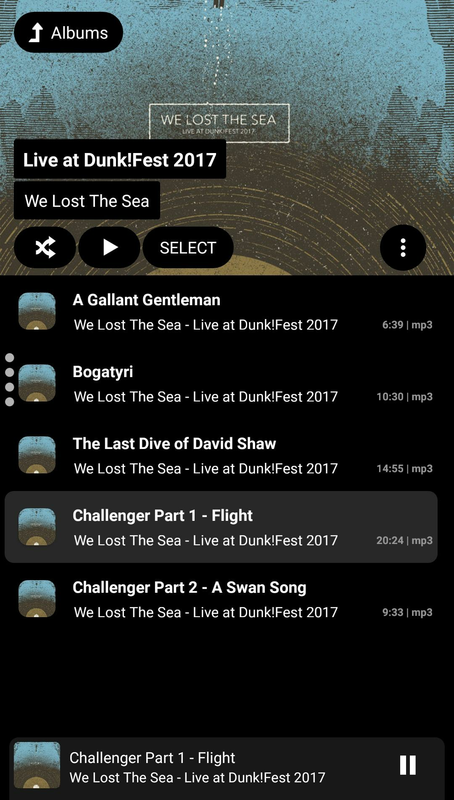 In Poweramp v2, there was an option in Settings > Queue so that the queue did not start playing until end the of the current list (i.e. at end of current Album in your case). During the re-coding of v3, that option somehow got omitted and only the 'Immediately' and 'After Current Song' modes got carried over. Restoring the 'After Current List' option has been requested by a number of people, and hopefully @maxmp the dev might be able to restore it in a future release? Re the textual information in the list view: I agree that Album Title is probably redundant to be shown on every song line when using Albums view (Artist is still needed though, as many albums contain material by various artists). However the full detail is needed for most of other list views (folders, genres, playlists, etc) and I believe from what Max has said in the past that the code for showing such text is currently common to all library view types.